I love these kinds of questions It’s like asking if California has the best sunsets or places like Beijing or Kyoto or Seoul or Bangalore do. Which city has your favorite sunset? As marketing people, we ask and get asked this all the time. Which one will win? Because with every battle royale there must be a winner and I guess it’s something to write about. Spoiler alert: the answer is at the end. But trust me, you don’t want to miss the other content so here we go. HDMI clearly leads in the TV and consumer space. Every TV, set top box, and game console has an HDMI port. Bigger laptops have HDMI, and it’s cheap to buy a converter to go from USB (or DisplayPort) from your PC to HDMI. Since most projectors were replaced with cheap (and excellent) TVs, HDMI quickly became the standard for most displays. The downside to HDMI is that it requires a royalty per port. I’ve never been clear on this but I think it requires a royalty per externally used port. So if your chip has HDMI capabilities, but your customers’ products doesn’t have an HDMI port then it means that your customer doesn’t need to pay the royalty. If it’s a Blu-ray player with HDMI, the Blu-ray player manufacturer likely must pay the royalty. Again, I don’t know but I believe the royalty is in the range of 5 cents or something, which doesn’t seem like a lot, but for high volume products like Blu-ray players, every fraction of a cent a chip maker can save a system maker is money that goes straight to profitability. 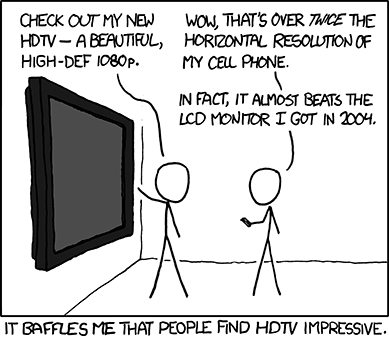 For this reason, DisplayPort is a standard that’s been pushed/encouraged for a long time. It has the same content protection as HDMI to helps prevent content from being copied. DisplayPort does not have a royalty. It’s widely available on computer displays, some projectors, and most “work” PCs. Again, it’s easy to get an adapter that converts from USB to DisplayPort or DisplayPort to HDMI. USB has supported video for a long time now. It’s had an ability to deliver video with content protection without DisplayPort or HDMI. It never really got standardized in a useful way. DisplayLink with their adaptive compression is the probably best and most reasonably priced solution. DisplayLink allowed you to use USB on one side and DisplayPort or HDMI or VGA on the other side. If you had their driver, the system would automatically detect and convert from USB to the targeted video standard. I really, really wish USB would be the standard for video. With USB Type-C, alternate mode can be a possibility with companies like Huawei enabling DisplayPort over Type-C.
HDMI and DisplayPort will coexist forever, and USB Type-C will coexist with HDMI and DisplayPort forever. Type-C adds to the abilities of all mobile phones. If you are building a product, it will be to your advantage to include support for all three standards. Adapters will be used to convert between the standards. This post is filed under DisplayPort, HDMI, USB Video.